Western Digital introduces the second-generation WD Black SSDs – the WD Black SN750 NVMe solid state drives. The WD Black SN750 uses a single-sided M.2 2280 form factor, offered in capacities ranging from 250GB to 2TB. The WD Black SN750 NVMe SSD also sports a stylish black heatsink that helps maintain the temperature which stabilizes performances. The heatsink was designed by expert and seasoned PC hardware cooling engineers from EK Water Blocks. The WD Black SN750 is the perfect storage solution for gamers and casual computer users alike. 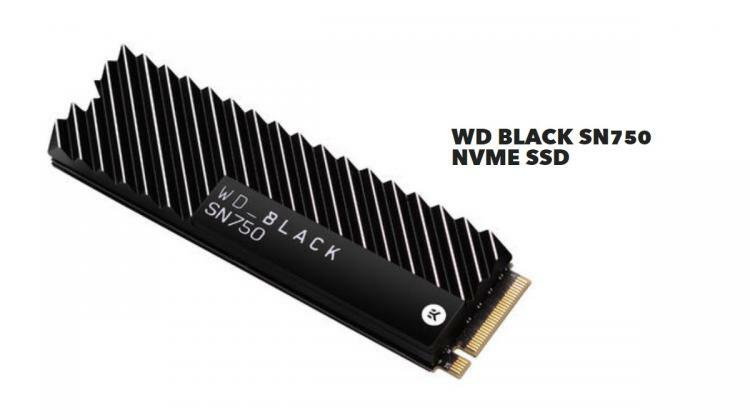 The WD Black SN750 NVMe SSD uses in-house developed 3D NAND Technology, controller, and firmware. The WD Black SN750 offers speeds of up to 3470MB/s for models with a capacity of 500GB or higher offering a significant reduction to load and boot times. The Black SN750 SSDs also offers up to 515,000 random-read and 560,000 random-write IOPs. Use the WD BLACK SSD Dashboard to optimize performance by enabling the ‘gaming mode’ which prioritizes your game. The WD Black SN750 SSDs will be featured at PAX South in San Antonio, United States. MSRP is from $79.99 USD for the 250GB model up to $499.99 for the 2TB model. The WD Black SN750 SSDs will be available globally this Spring 2019. Learn more about the WD Black SN750 NVMe solid-state drives here.